When she lost her toes and part of her feet to meningitis, Ava Bainbridge had barely even learned how to walk. More than a year later, the two-year-old is ready to try again – thanks to a unique pair of slippers. The prosthetics are the first to be made for someone so young, and were built with a set of toes to help Ava walk. 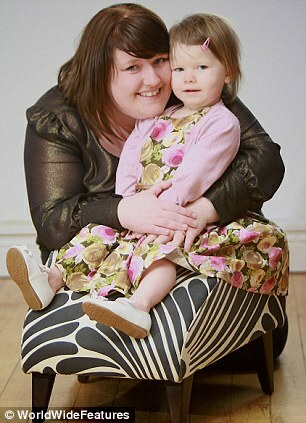 Her mother, Gemma Clay, 27, said: ‘It has never been done before and they have been designed especially for Ava. She is thrilled with them as now she can wear normal shoes again. Ava contracted the deadly illness last January, when she was 14 months old. Miss Clay, who lives with her partner Ken Bainbridge, 32, and Ava in Newcastle upon Tyne, said: ‘They diagnosed her with meningococcal meningitis and septicaemia and within half an hour she was on a ventilator fighting for her life. Ava’s toes went black, but doctors managed to save her fingers with drugs used to fight frostbite. Surgeons eventually had to remove Ava’s toes and half of each foot, as they were damaged beyond repair. After the operation, Ava was given foam blocks to put into her shoes to help her walk again, but she found them too uncomfortable. Then experts at Dorset Orthopaedic, a prosthetics firm, came up with a better idea. They built Ava a tiny pair of silicone slippers with toes on the end, allowing her to walk properly and wear ordinary shoes. They cost £900, which was raised by Ava’s family and friends, and will need to be replaced with larger versions as her feet grow. ‘She loves the new slippers,’ Miss Clay said. ‘She thinks that we have bought her some new toes from a shop. A spokesman for Dorset Orthopaedic said: ‘This is the first time we have ever made these for someone so young.